I couldn’t find a decent picture of the whole set of the green theme hantaran during the event day itself. What I have is only a few pictures taken after I have done the hantaran the night before. 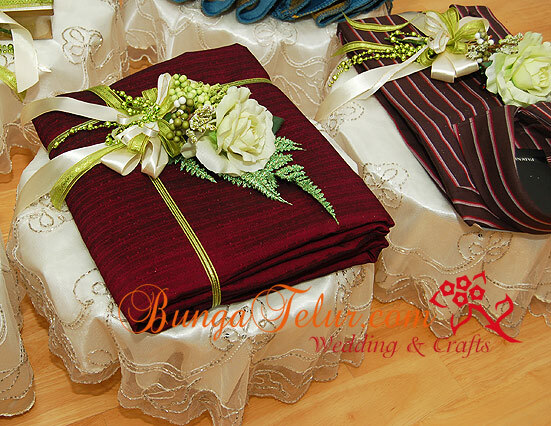 The whole hantaran style was really simple, just put the artificial bunga dulang either on the hantaran itself or by its side. 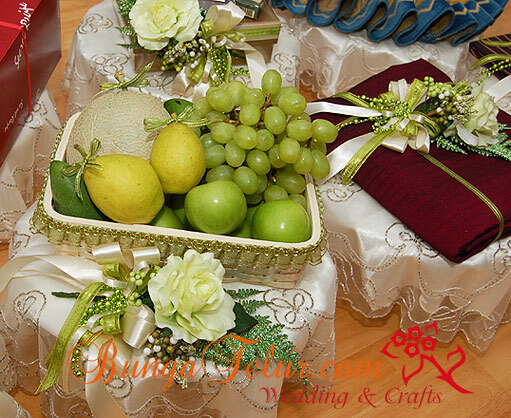 SIL bought all kind of green-like fruits – pear, rock melon, mangoes, green apple and green grapes for the occasion, just about right with my wish to complement the cream and green theme..hehe! I asked Niece #1 and #2 to fold the kain for baju melayu into a book-like lipatan. 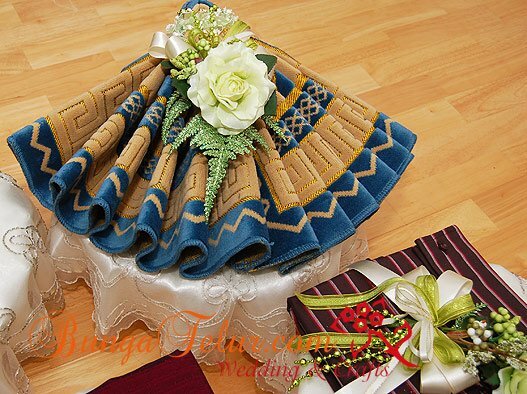 I am not fond of gubahan kain hantaran into any funny and intricate lipatan as it sometimes ruin the texture of the clothing and (most of the time) will create thousand creases. As usual, for a hard sejadah (praying mat) like the one in the above picture, the easiest way to gubah it will be to fold it into fan-shape. Not much should be done with the perfume set as it is already wrapped nicely by the departmental store.